PHILADELPHIA, PA – Equality Forum, coordinator of LGBT History Month, as well as a producer of documentary films and convener of the international LGBT civil rights summit held annually in Philadelphia, today announced that all three of its award-winning documentaries will be available on Xfinity On Demand in the LGBT Film & TV Collection in celebration of LGBT History Month. “Saint of 9/11” - Narrated by Sir Ian McKellen, “Saint of 9/11” chronicles the remarkable life and death of Father Mychal Judge, Chaplain of the New York Fire Department—the first official victim of 9/11. Since its world premiere at the 2006 Tribeca Film Festival, “Saint of 9/11” has received international acclaim and has been featured on ABC’s “World News with Charles Gibson,” CNN, PBS and C-SPAN. “Gay Pioneers” - A compelling documentary, “Gay Pioneers” presents the story of the start of the LGBT civil rights movement at Independence Hall. Coproduced with PBS affiliate WHYY, this enduring film braids interviews with Frank Kameny, Barbara Gittings and other early activists with archival footage and FBI investigative reports. “JIM IN BOLD” - About the life cut short of young gay artist and poet Jim Wheeler, “JIM IN BOLD” is the leading film about the impact of homophobia on LGBTQ youth. This inspirational film has won multiple awards and has been screened worldwide. 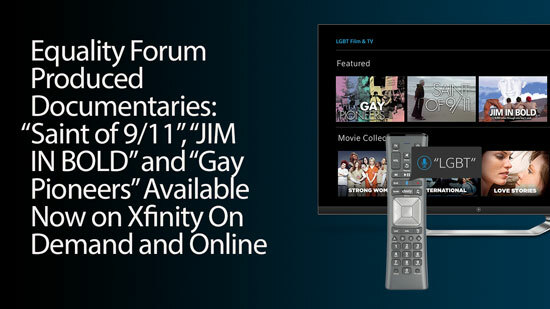 “We are so pleased that these important and inspiring stories are being made available to Xfinity Video customers in its LGBT Film & TV Collection,” said Malcolm Lazin, Equality Forum’s Executive Director, the nation’s leading organization on LGBT history. arlier this month, Equality Forum launched LGBT History Month by releasing a list of 31 LGBT Icons, living or dead, national and international who were selected for achievements in their field of endeavor; for their status as a national hero; or for their significant contribution to LGBT civil rights. Equality Forum solicits nominations from the public. Nationally prominent professors Lillian Faderman and Paul Farber, 2016 LGBT History Month Co-chairs review all nominations and recommend the annual Icons. Equality Forum is currently accepting nominations for LGBT History Month 2017. The deadline to nominate an Icon for next year’s LGBT History Month is Friday, December 9th, 2016. You can submit your nomination online, here.